A lot can change in five years. Five years ago I wrote an editorial that turned into one of the most read articles on this blog. I wrote that “All of a sudden putting a smartphone OS into your car doesn’t seem so smart.” I worried back then that if carmakers tied their destinies to either Apple CarPlay or Android Auto, they’d be hurting their cars’ appeal and resale value. Choosing sides would hurt them, and their cars’ infotainment systems would become obsolete as new operating system versions left them in the dust. It’s been a while, and having just spent some time in a Chevy with both Android Auto and CarPlay built in, I have some new thoughts on the subject. I was pleased to see that not only did Chevy put both Android and Apple compatibility into the car, but they made it easy to switch back and forth. It looks like other carmakers are following suit, with Toyota finally leaning toward Android Auto in addition to the CarPlay support they’ve already had. With both systems, most of the work is done by the phone itself. The entertainment system is reduced to being an input device and second screen, basically. It should mean that the systems are relatively futureproof, since all the software resides on the phone. It’s essentially like Bluetooth where the phone and car just need to communicate at some level. Of course old cars have problems with new Bluetooth phones so maybe that’s not the best comparison. 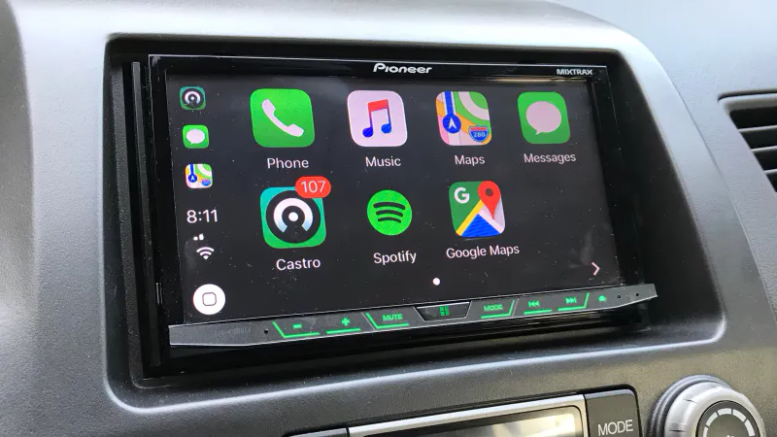 Using CarPlay or Android Auto gives you a live scrolling map. It’s like the one in your GPS-enabled car, although it’s probably smoother and more detailed. Cars with built-in GPS often came with high price tags. The GPS systems were built with gyroscopes, DVD-based map systems, and durable hardware designed to last the life of the car. This made them very expensive to buy and just as expensive to upgrade. With Android Auto or CarPlay you get that mapping software for free and it’s always up to date. You also get voice command for a lot of features, something found in older luxury cars as well. As Siri, Bixby, and Google continue to evolve, they’ll get better. The point is that with these new systems you’re getting evolving features because you’re going to probably upgrade your phone 5 times before getting a new car. One of the things I don’t like about CarPlay and Android Auto is that you absolutely have to connect via cable. I don’t understand why you can livestream full motion video but you can’t connect to CarPlay wirelessly. Perhaps it has something to do with running down the battery. Maybe doing all that car stuff runs down the battery more than you’d expect. Still it’s frustrating if you’re the sort of person who isn’t used to plugging the phone in for every trip. Several times I left my phone in my car, in plain view of burglars. Luckily nothing was stolen, no windows were broken. And, not every carmaker or every accessory provider supports both. There are still some who make you choose between one or the other. Usually if only one is going to be supported, it’s going to be CarPlay. That’s a drag for the roughly 90% of people who have Androids. It also creates a safety issue. You spend a lot more time touching the screen and a lot less time touching physical buttons. Looking at the screen means you’re not looking at the road. Of course this isn’t really a problem limited to CarPlay and Android Auto. More and more automakers are putting big touchscreens in cars. They’re fun to interact with but there’s a real fear of distracted driving. If you want to add CarPlay or Android Auto to your existing car, Solid Signal carries two entertainment systems that support both. We’ll be carrying more in the coming months as well. I think they’re both an excellent upgrade to older car systems, as long as you understand the limitations and keep your eyes on the road.